Intermountain Division honored some of its outstanding coaches and officials Wednesday evening, 5/23/2018, at its Spring banquet. Official of the Year went to Scott McGrew of Sun Valley. His outstanding effort as chief of race at this year’s U.S. Nationals and Junior Nations was cited among his many other accomplishments. Coach of the Year for 2018 is Adele Savaria of Sun Valley. She has coached in IMD for 25 years. Volunteer of the Year is Becky Stone of Snowbird, originally Brighton, who has run the IMD YSL program for 12 years. A special lifetime achievement award was presented to out-going IMD Board of Directors President Mike Hammer of Jackson Hole. Mike is retiring from ski racing after decades of volunteer work. He is an IMD TD and served for years as the division Alpine Officials Chairman. The IMD Scholar Athlete of the Year is Elsie Childress of Bogus Basin. The 79th Intermountain Division Alpine Convention will take place May 23-24 in Jackpot, NV. Rowmark’s Troy Price was named Development Coach of the Year by U.S. 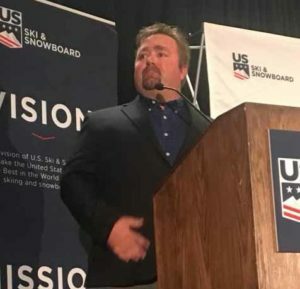 Ski and Snowboard at its annual Spring Congress awards banquet in Park City. Congratulations Troy and superb job.